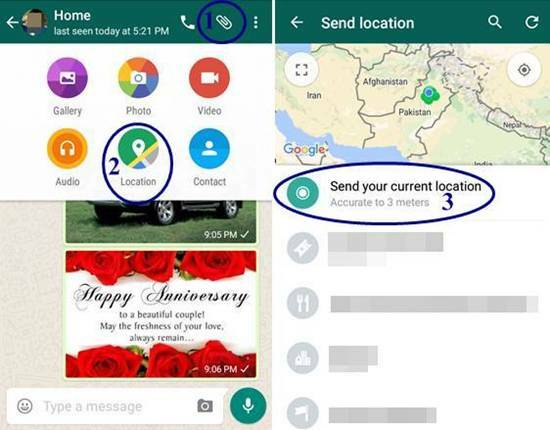 Home / Facebook / Facebook Tips / GPS / Location / Maps / Tips / Tips & Tricks / WhatsApp / How to Trace Location of Friends using Whatsapp or Facebook Messenger? How to Trace Location of Friends using Whatsapp or Facebook Messenger? Finding out the truth about where your friend is very easy now. Usually we don’t need to trace location of anybody but sometimes we want to know the exact current location of someone, especially in the case when you are waiting for someone and he is continuously telling you “on the way” lie but actually he is still at his home or office. Sometimes our friends lie to meet us and make excuses. It can also be used to know the location of your spouse, children or younger siblings. If you think that anyone is not giving you true information about its current location, you can easily find his location. We can track exact location of our contacts to know whether they are lying or not. Today I am going to tell you an easy and proven way to track the targeted person’s location. The person, whom you want to track, must have a smart phone with Facebook messenger or Whatsapp installed. Insist the contact (whom you want to track) shares his current location with you by tapping on the ‘clip icon’ on top bar, then select ‘Location’ and then select ‘send your current location’ on the top of the list, ask him not to select any other option from the list. You can find if he/ she has entered the address manually by selecting any other address from the list. There is a hint in the manner the location of the sender appears in message. If it’s a real GPS-based current location, the location share will appear as a dropped pin without any address below the map image. But if it is not his current location and he has entered it manually, its address will appear below the map thumbnail image. The same feature is also available in Facebook Messenger. So if your friend is using it, you can still ask him to share his location the builtin feature of the FB Messenger. Look for the "location button (pin drop)" while typing message and select it to share your location with the friend. In FB Messenger too, you can check that either the sent location is automatically sent or selected manually in the same way as described above. There are many facilities that are readily available in today’s high end mobiles but we don’t know to use these features/ facilities due to our unawareness about it. This is one of these features. If you know any other such feature, please share it with us.